In the past few years, the e-commerce industry has risen from being a mere alternative to a necessity for shoppers and has witnessed an unprecedented rise in business. The breakneck growth of the e-commerce industry is creating a widespread demand for warehouses equipped with better loading equipment. Speedy delivery is a crucial factor for the e-commerce industry besides the quality of the product, thereby making efficient logistics services a prerequisite. Loading equipment such as dock levelers offer unparalleled performance and power. Such equipment is becoming popular in warehouses and fulfilment centers for material handling as it increases the productivity level and provides better safety to the goods. In order to be on the run and improve their working speed to fulfill online orders faster, almost all warehouse facilities are anticipated to adopt such dock levelers, which is driving the demand in the global dock levelers market. Europe regulation 178/2002 states specific requirements such safe handling of food and loading and unloading of beverages and medicines in warehouses. Moreover, Europe regulation 852 on the hygiene of foodstuff requires maintenance of cold chain warehouses. It pertains to the efficient handling guides and temperature and micro bacterial controlled requirements based on experimental risk estimates that apply to all storage and transport facilities in Europe. Expansive areas are used as storage houses and for the efficient loading and unloading of goods at the loading dock, basic equipment such as dock shelters, forklifts and dock levelers are required. The surge in temperature controlled warehouses due to the increasing demand from the beverage, food and medicine sectors to retain the freshness of products has increased the demand for vertical storing dock levelers. The main purpose of a refrigerator warehouse is to provide a controlled temperature environment. All cold storage warehouses require a specific type of dock leveler such as a vertical dock leveler, which operates in a subzero environment. The expanding sea trade and port activities in Europe have resulted in the maximum use of dock levelers in the region. According to the Supply Chain Management of United States America, the U.S.’s spending on logistics business and transportation was US$ 1.48 Trillion in 2015, which was 2.6% more than that in FY2014 and this US$ 1.48 Trillion represented 8% of the U.S.’s annual GDP. The logistics industry is expected to enter a new era in the next year with the primary driver being the explosion of omni-channel retail and B2C e-commerce. Revenue of transport by trucks over medium-to-short distance in 2016 was US$ 676.2 Bn according to the American Trucking Association. If these statistics are anything to go by, it can be figured that the growing number of logistics startups in North America will pave the way for a higher adoption rate of dock levelers. Logistics is anticipated to be the next engine of growth in the global economy. Growth of e-commerce is only possible due to a robust logistics network. With the recent adoption of e-commerce trends, a number of logistics startups are developing globally with redefined and disrupt dock loading equipment. These logistics tech startups are deploying innovative approaches to revolutionize logistics solutions and the industry is changing to get smarter and better every day. Logistics startups that provide powerful backend technology along with dock equipment have become the need of the hour as they have become imperative for loading and unloading goods. 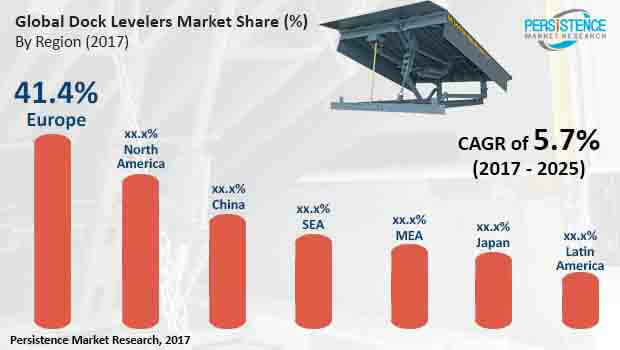 Going forward, it is expected that there will emerge a plethora of opportunities and immense demand for dock levelers in the global market. MHE Demag (S) Pte Ltd.